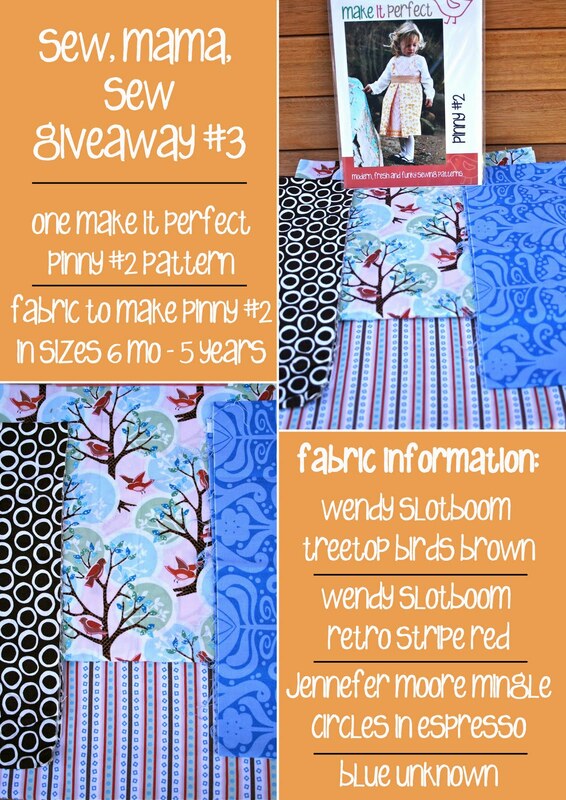 make it perfect: .Sew, Mama, Sew Giveaway Day #3. .Sew, Mama, Sew Giveaway Day #3. I really like this pattern! And the fabric is gorgeous... crossing my fingers and toes! Lovely prize - this would suit my daughter down to the ground! You're so generouse with all these giveaways that your offering. Thank you so much. It's all so gorgeous - I'd love to win! wow, your giveaways are amazing! I would love to win this one and I would have to have the circles in Espresso! Such a cute pattern and cute dress! Adorable!!!!! All your giveaways are amazing! What fantastic giveaways! I love the fabric choices, they would make a perfect pinny. I think I could tacklet this pattern now! That fabric is beautiful!! Love it! The pattern and fabric is wonderful. I hope that I win. I SEW want to win this!!! What a fabulous giveaway!! I'd love to make this up for my littlest! lovely prizes you are so generous! Please pick me I never win anything. I love this pattern. I already have Pinny #1, so Pinny #2 would be perfect, my 5 year old would love a new dress. I love the unknown blue fabric - it's gorgeous! The fabric is so lovely in this pack. Loving the Pinny dress. Your designs are so simple and lovely. Love that pattern :) Such gorgeous fabric too. What a super giveaway! I love your patterns Toni and would love to enter your giveaway. Thanks. I love the blue fabric! Enter me please! Wow awesome giveaways Toni!! y daughter would love this! I love the fabric! Thanks for the chance! Naaaaaw, so sweet, what a giveaway star you are! That fabric looks great together...such a great giveaway- thanks! Love the pattern. And the fabric. So much gorgeousness here. You are a popular girl Toni! Check out all the comments! Gorgeous fabric! I'd love to be entered! Gorgeous giveaway!! count me in! I love that pinny! The fabric's pretty great too. Thanks for your generosity. I'm keeping my fingers crossed for ANY of your great giveaways! EEEk that fabric would make a beautiful Pinny! i especially love the fabric you've chosen here.. another beautiful giveaway!! haha, the characters i have to type to verify this post is "likem" and its so true about these giveaway items, i sure do likem! Truly, a third giveaway!!!! WOW. Count me in again. I can feel it in my waters - it may just be my lucky day! As I said before: I would love to win EVERYTHING you make! I'm sooo happy I found your blog. Thanks to Sew Mama Sew's Giveaway Day! Wow! Those are some fun fabrics. I'd love a chance to make that dress. Would sure like to win this one! So cute! Such cute fabric in these! I love the patterns too! Love the pattern and the fabric! Thank you for this great giveaway! The fabric for the pattern is awesome! This fabric is wonderful! Thank you for this giveaway! Oh my daughter would just be adorable in this dress. Pick me! PS. I am anxiously awaiting some free time to try your Kaftan pattern. Awesome! You are so generous! Thanks for the chance to win--would love to make this for my daughter. How beautiful, thanks for a chance to win. thanks for the giveaway. I love all the fabrics you've chosen. I really like all the patterns, but the fabric to make them is included! This is my giveaway! That fabric is to die for! Thanks for the chance! Oh I love the bird fabric! And pinafores are so cute! thanks for the giveaway! What a great giveaway! Love the pattern! I love the pattern and the fabric! I would love to make this dress for my little girls! Thanks for the great giveaways. I'd love to make that for my little girl. LOVE these! Have a beautiful and fantastic day! I'll be blowing a dandylion wish in honor of this today! Be blessed! loving this fabric and pattern! Omygosh I have to win this one! I need that fabric, and the pattern. Fabric makes my heart go pitter patter! You are so unbelievably generous! Thanks! love it - you are too generous! Thanks for the chance! So many giveaways and so lovely things. The patterns are lovely! This fabric is nothing less than fabulous! I love it! My friend's daughter needs this dress! It is just so darn cute! Love it! The fabric is great! WOW ! So unbelieveably generous in your giveaways... thank so much for the oppotunity to enter ! Would love to win ANYTHING of yours ! Favorite giveaway so far...Thanks for the chance..
Oh so lovely this pattern, how generous you are!!!!! Lovely fabric and great pattern. I would LOVE to win it! Thanks again for your generosity! My daughter would love this dress!! Thank you! I love those fabric selections. What great taste! Oh my goodness, oh my goodness! I have girls who are 1 and 3, and this pattern would be SO sweet on them! I would love that pattern. Thanks for the chance to win! I love that pattern! Thanks for the great giveaway! That dress pattern is SO cute! Just in case I don't win, I'm adding it to my "must have" list! I love the pattern and the fabrics are so cute! How is it I have never seen your patterns before. So beautiful! What a great giveaway - really like the look of your patterns. I don't really have any little people to sew for but have been itching to sew for a little girl......so I enter. I'd love to win! Very generous. My girlie totally needs a new dress. This is too sweet! Holy smokes at the giveaways here! I like this pattern - perfect for my daugther. Love that fabric! So pretty. Thanks for the chance! This would be grand to make up for my daughter. Oh this fabric is gorgeous and that pinny pattern looks so cute. Thank you for the chance at this giveaway. What a cute pattern! I know a little girl who would love to wear it. Thanks for the opportunity. These are so very cute as well. I'd be so lucky to win! your giveaways are amazing!! i love the fabric and the pattern. thank you so much!!! The pattern and fabric are adorable! You are so generous! I love the fabric. Thank you! Such a cute pattern! my baby girl is turning 2 next month and this would be a great gift! I love the font and the graphics that you use on your blog. Adorable! I'd love to win! Beautiful work! Thanks for having a giveaway! Oh, this is great! Thanks for the giveaway! All the fabrics go so well together. I love that pattern - the only hard part would be deciding whether to make it for my older girl or my younger one! I guess probably the older one - then the younger one could wear it in a few years! The treetop bird fabric is perfect! I love it! Thanks for the chance to win such lovely items! aww the little dress is so cute, would love to win it. lovin the fabric! Thanks for the chance to win! This is beautiful!! Thanks again for your giveaways! How incedibly generous you are. I love this fabric and have not one, but two girls to sew for. Thanks for the giveaway. Hooray for Toni and Make it Perfect- thanks for 3 lovely giveaways! Okay, you got me. Wendy Slotboom? Gosh I just love her. I have to say that there are many great giveaways today, and yours are definitely right up there at the top with the cream. Just perfectly lovely. I love your prize package! Adorable pattern and lovely fabrics! love the fabric and colors. I super want to win this one. Love those fabrics! Count me in! Wonderful pattern and beautiful fabric! So generous! This pattern is adorable--thanks for the chance to win! My niece would look gorgeous in this!